What’s up guys! Got some fresh news for ya! Ableton just released a killer bundle of new synths with their latest Max 4 Live Essentials Collection. This bundle is free for anyone who owns Live 9 Suite or has purchased Max 4 Live, so hop on that upgrade if you haven’t already. Download the Max 4 Live Essentials Bundle here. First: Bass! A monophonic, analog modeled bass monster – which we’re going to put through its paces in this video. Second: Poli! As you may have guessed, a polyphonic virtual analog synth with de-tunable oscillators. And last but not least: Multi! Which they cryptically call a “Multimode” synthesizer and it does a lot of fascinating, unconventional and random things. More on Poli and Multi in another video because today we’re going to make some Bass. I’m going to give you a rundown of some key features of this new synth and show you an example of how I’ve been using it in my sound design to get some fat, analog bass sounds. My goal here is to get you up and running with this synth in a matter of minutes. This isn’t an exhaustive tutorial where I’m going to cover every minute feature. I’m going to take an example patch I built, and show you how I made it. After that, you’ll be off to the races! As always, there’s a free download of the patch & Rack in this video, to grab it just enter your email address at the top of this blog post, and feel free to use it in your own tunes. You’ll need Ableton Live 9.5 Suite or Live 9.5 with Max 4 Live to open the set. The download includes the synth patch and all the Racks. The rest of the tune is something I’m actually getting ready to release, so that’s not included. Alright, let’s dig into this patch and deconstruct it. First up, I want to show you where Bass installs. It’s not in your regular Instruments area of the Browser. It’s in Max 4 Live, under Instruments. I made this bass patch using a combination of 2 Bass synths in an Instrument Rack and a series of processing Racks with FX. If you deactivate the Racks, you can hear the dry sound is this nice LP filtered sound with envelope mod and drive. Next up we have a custom multi-band Rack that uses phase cancellation to do a perfect split between the high and low bands, so I can process them separately. This is important for doing things like narrowing the subs into mono and using stereo effects on the highs. Capping off the chain is a Bass Processing Rack that has all kinds of goodies in it, like multiple rounds of parallel saturation, a specially designed multi-band compressor, my own emulation of the Dimension Expander from Massive, and a Convolution Reverb dialed in to sound like the impulse response of a nightclub. These Racks are also included in the free download below because I think you’ll get a lot out of them on your own basses. What is the Bass Synth? I really like this instrument. It’s an extremely user friendly, fat sounding subtractive synth. It does one thing and it does it well. Bass! It’s monophonic, so it only plays one note at a time and if you overlap notes, the new note will steal the spotlight and kill the previous note. Each of the instances is identical, save for one thing; detune. I wanted to have the option to detune the oscillators, and you can’t do that on a per-oscillator basis, so I duplicated the synth and Macro’d in some master detune that can spread one up 12 cents and the other down 12 cents. That’s one of things I like so much about Live’s Racks; how easy it is to build up thicker sounds by using modules. Up first is the Oscillator section. You actually have five oscillators packed into this little monster! Well, six if you count the LFO. Instead of having a single oscillator with different waveforms, each oscillator is locked to a different waveform. You have a sine, sawtooth, square, and triangle. The square and triangle both have Pulsewidth control, which I decided to Macro. There’s also a Sub Oscillator, which is a sine wave tuned an octave below the other oscillators. It also has two convenient controls: Tone and Thru. Tone controls how much distortion is applied to the sub oscillator, and Thru allows the sub to bypass the filter section. Really handy for when you’re doing heavily filtered basses and you still want a rock solid sub. It’s similar to Serum’s direct out function or Razor’s safe bass. Lastly, we have a parameter called Analog, which adds a touch of pitch drift similar to vintage analog synths. In this patch I’m using a combination of the sawtooth, pulse, and triangle oscillators. Next up is the Filter section. The available filter types are lowpass, dirty lowpass – which is a distorted version, highpass, bandpass, and a notch. You’ve got familiar controls for cutoff and resonance, plus a stage of drive right at the filter, and then filter envelope amount. The filter envelope is a standard ADSR envelope directly below. You can see in this patch I’ve created that plucky sound by decreasing the sustain to zero, setting up a short decay, and Macroing the Env Amount to the Instrument Rack. Similar to other Live devices, you can scale the envelope time. You also have a basic LFO section with standard controls for fade—in, rate, BPM sync or free rate, retrigger, and waveform shape. The LFO has 4 destinations it can mod: Pulsewidth, Pitch, Filter cutoff, and Volume. I’m not using any LFO modulation in this patch, but definitely experiment with that in your tunes. Finally we have the Master section, where you can control tuning in octaves, semitones, and cents. This is where I’m using the Rack Macro to control the fine pitch by 12 cents on each synth. You have pitch bend that can go up to 2 octaves, and glide. If you click the glide switch, it enable portamento and legato playing simultaneously. What that means is that sliding between notes happens only when 2 notes are held and that any envelopes won’t be retriggered when any subsequent overlapping notes are played. An added bonus here is a second stage of distortion in the master section. It gets quite gritty at higher levels. On a final note, you’ve got master volume and an ADSR amp envelope with the same 5x envelope time scaling. Macro 1 is mapped to the lowpass filter’s frequency. Now, the filter cutoff is already being modulated by the filter envelope, creating that pluck, so this is a second stage of modulation. I can begin to open the filter, while still retaining that percussive attack. Macro 2 is mapped to the volume of the square wave (aka the Pulse oscillator). Macro 3 is controlling the pulse width of the square and triangle wave. Macro 4 is the detune and gives us a fatter, thicker unison sound. Macro 5 is filter drive. Macro 6 is glide time. Macro 7 is the filter envelope amount. Macro 8 is the master distortion. This gives you a lot of control right from the front Macro panel so you don’t need to waste time digging around inside two instances of the synth. Pro-tip: It’s also killer to use Macros for doing things like filter modulation because of the ability to scale the modulation after the fact. Let’s say I draw in all this mod, but then I decide the filter is moving too much. If I’d modded the filter cutoff directly, I’d have to adjust all my handwritten track automation. Gah! With Macros though, I can simply open up the Macro Mappings Browser and edit the range of the modulation. Easy peasy. We did a flyby of the Bass synth’s interface, touching on how to build up your sound with the five oscillators, including the dedicated sub oscillator. We covered he ways you can further dial in your sound with Pulsewidth mod, and the Tone and Thru controls for the sub oscillator, allowing it to bypass the filter for a guaranteed solid sub. Then we looked at the filter section and filter types, including that sweet filter drive parameter, as well as the modulation sources and destinations and master section. Finally, we looked at how you can use Instrument Racks and Macros to build up thicker modular sounds and really flex the full power of this synth. I’m sure you’re stoked to start using these in your own music, and I’m excited for you to try this out. 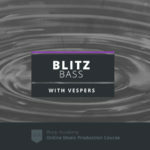 Don’t forget to grab the download of this Bass patch and the processing Racks I built for it so you can build up your library and tweak them yourself. Just enter your email address at the top of this blog post for the download.